After I became a mom I used to daydream about going back to the hospital. Not for anything serious; just an overnight stay after a broken bone or something like that. People would bring me chocolates and flowers, and my narrow hospital bed would have room for only one person. In this fantasy, I would be alone, apart from a nurse who would check on me or bring me a cup of something warm. And I could sleep. I was a new mother, and I was exhausted. I felt very guilty for wanting this. Even now I feel a twang of remorse admitting this, but I also think it’s important that I do. You see, it took me a long time to forgive myself. My son was a gift. A blessing. He was healthy and his delivery was uncomplicated. We hadn’t struggled to conceive, and my pregnancy was low risk. We didn’t even have problems bonding when he was born. I knew I was lucky that things went so well, I thought that meant I should be constantly happy. And I was, but I was also unrealistic. I thought that if I didn’t do everything perfectly, I would somehow fail as a mother. If I didn’t spend every waking moment with my child, if I so much as wanted time away from him, it would be just as bad as abandoning him, and that there must be something wrong with my mothering if I ever asked for help. There was a lot of “should of’s” flying around inside my head at that time. I had no idea how mentally, physically and spiritually tiring my new role could be. 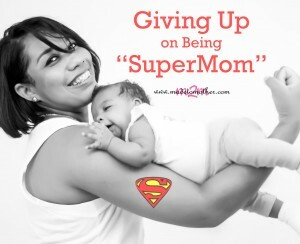 I expected too much from myself and thought I had to be “SuperMom.” And SuperMom doesn’t need help. time alone, nor does she need sleep. My perfectionism was a cover up for trying to control the uncontrollable. From the moment our son was conceived I was terrified that something would go wrong. And when he was born I loved him so much, more than I ever thought possible, I put this kind of system in place to protect him. The result was neuroses. I listened to my midwife who constantly insisted that “breast is best,” I hung on to every new suggestion the American Academy of Pediatrics came up with like co-sleeping is dangerous, and I read every baby book from cover to cover that I could get my hands on. I slept in snatches of twenty minutes between feedings most nights, and was so terrified of falling asleep with the baby in bed that I would occasionally nod off nursing on the baby room rocker or the living room couch. I followed all the advice, not my instincts, and the result was increased risk. My fears had made me paranoid and more than a bit irrational. I concluded that if things weren’t done by the book, that must make me a bad mom. I couldn’t allow myself to make mistakes. Eventually fatigue made these feelings worse, and my guilt from longing for an escape made me even more afraid that I had failed in my new role. It was a ruthless, vicious cycle. The funny thing was, despite following the all the “rules,” my son still got sick. He still cried, and behaved like any normal, imperfect child. After a few weeks of this, I cracked. And eventually something in me just let go. I realized that no matter how hard I tried to protect him, my son was going to still experience life. Eventually, where there was once only fear, slowly became trust. I asked friends and family for time to rest, and I slept. I allowed others to enjoy time with my baby, which gave me the chance to recuperate and also resulted in a clearer head. It turned out that buried beneath all my stress, anxiety and all those insecurities swimming around my mind, there was a powerful maternal instinct waiting to be discovered. It occurred to me that the people writing the baby books didn’t know my child or his needs. So I began to make the choices I felt were best for him regarding sleeping, napping and feeding. I allowed my husband to become involved in my decisions. I tried different things, and when they didn’t work out for us, I adapted rather than spiraling into self-blame. During my second pregnancy, I continued this maternal trend. I forgave myself for resting when I could have overdone things playing with our son. Of course I still fretted over the pregnancy and birth, but I didn’t obsess over every little thing like I had before. Not everything in life goes according to plan. Sometimes it’s even better. I won’t lie by saying that I’m now the world’s most relaxed mom. Every now and then I catch myself struggling with the same old inscurities and misgivings. I still strive to be SuperMom, but I forgive myself for being human, and you know what? My sons, now five and two, are very forgiving too. Renee lives in California. She a wife, mom, sister, daughter and friend to a wonderful family. In her free time she loves to write and read. I too had visions of returning to the hospital for a quiet night alone Loved everything about this post – you go, mama!